Texas Drug Card had the opportunity to meet with Cook Children’s representatives, Karol Johnson, CMN Specialist and Erin McDonald, Annual Giving Coordinator. During this meeting a donation from Texas Drug Card was presented to Cook Children’s for $7,917.75. Karol and Erin took the Texas Drug Card team to the Atrium where special events take place. What was so special about this location is the hundreds of mirrored windows on all sides going up 6 floors that were all individual child patient rooms, where the children that cannot attend events can feel a part of them. We spoke about Cook Children’s promise to improve the health of every child in its region through the prevention and treatment of illness, disease and injury. Karol told us how Cook Children’s had received over $27 million in donations. The Texas Drug Card donation was specifically used to setup and plan events and parties for the children living in their hospital. 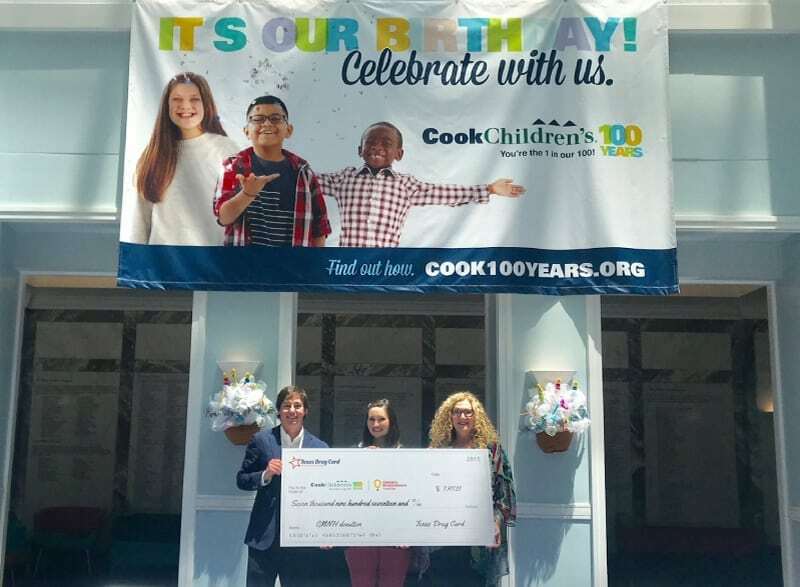 Texas Drug Card is a proud supporter of Cook Children’s and a donation will be made to your local CMN hospital each time a prescription is processed through the Texas Drug Card. Since 2015, the United Networks of America partnership with Children’s Miracle Network Hospitals has raised over $2.4 million dollars for local children’s hospitals. Of this, $7,917.75 has been raised for Cook Children’s.